There came a day when we agreed that the night’s dinner would be pork roast – but I had no clue what I was going to do to the pork…and we were on our way out the door for work. In a fit of desperation, I threw stuff together and I was shocked and amazed that it worked. Not only did it work, but we repeated it several times since, sometimes with pork tenderloin, always to super-tasty results. Now, sure, you can just skip even the work I did by simply making this a two-ingredient recipe (pork and barbecue sauce), but I actually like the idea of mixing something on your own, so you can adjust it however you’d like. 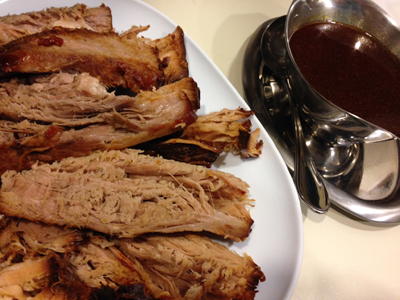 Note that if you’re cooking pork tenderloin, you can easily get away with a lower cook time – say, 8 hours on LOW. If, however, you go with the pork roast, I’d strongly suggest more like 10-12 hours, so it has plenty of time to cook itself to death and fall apart. I’m drooling just thinking about it. I will also note that this goes quite well with cornbread, making for a very simple meal, low on prep and high on flavor. Seriously, that’s just a combo made of win. 1. Spray the inside of a 4qt crock pot with non-stick cooking spray (or an olive oil mister, as we do). 2. Place the pork in the bottom of the crock. 3. In a measuring cup or bowl, add the ketchup, then the brown sugar and vinegar. Stir well to combine. Pour over the pork until it’s completely covered. 4. Cook on LOW for 8-12 hours. 5. Remove the pork to a cutting board and let it rest for about 5 minutes before cutting, then serve with sauce on the side. Sometimes, you just want wee sandwiches filled with shredded meat. I can’t say why; I just know that it IS a thing that sometimes people, like me, just WANT AND NEED TO HAVE RIGHT NAO. And thus, when I was planning for a fellow crock potter to come over for dinner, I figured that I’d throw stuff in the crock in her honor. She wasn’t able to make it to dinner after all, but we managed to get through dinner anyway. The biggest challenge: not going back for seconds. And thirds. This one is easy as all-get out, since it doesn’t require either A) a ton of ingredients, or B) a ton of time to prepare. Easy crocks are always full of win, in my book, and when they’re tasty, that’s serious bonus time. I will say that this sauce comes out a bit tangy, so we used potato dinner rolls as the slider buns. This ended up being a perfect combination, since the tang of the sauce was a natural accompaniment for the sweetness of the roll (and vice versa). 1. Place the first six items in a bowl and stir well. 2. Coat the inside of a 4qt crock pot with non-stick cooking spray. Spoon a small amount of the mixture from the bowl into the bottom of the crock and swirl it around to create a thin coat. 3. Cut the steak, as needed, to make it fit in the crock. (I had to cut mine into thirds.) If you have multiple pieces and they can’t all fit side-by-side, place one layer of steak in the crock, then cover it with some of the sauce mixture, then add another layer of steak and repeat this process until all steak and sauce is in the crock pot. 4. Cover and cook on LOW for 8-12hrs or HIGH for 4-6hrs. 5. Remove the steak from the crock and shred the meat with two forks. Put the shredded beef back in the crock and stir it back into the sauce to combine them well. 6. Spoon your desired serving onto a potato dinner roll or other slider bun. 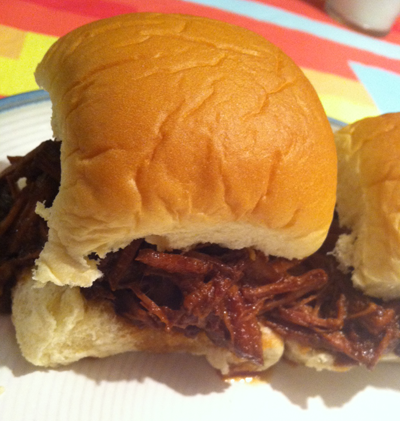 One serving = 2 sliders. I loves me some baked beans. There’s something about the sweet flavor, the instant protein rush of taking in all those beans…just the sheer yumminess. Some things are definitely comfort food, and (before the kids nixed it) we used to have baked beans somewhat frequently during the summer. Of course, I wasn’t making my own beans – I was popping the top on a can of Bush’s or some other brand, since it was infinitely easier than making my own and sitting by the stove for a few hours. Alas, the kids gave this one a meh rating ONLY because dd just can’t deal with things being in sauce or mixed or touching or OMG THERE ARE FOODS NOT BEING SEPARATED BY MILES OF SPACE. As I recall it, ds ate it well enough, but he’s a bit dubious about beans, so this really ended up being more of a me-and-dh kind of meal. I have to say that’s entirely THEIR LOSS. This not only came out well on night 1, it also reheated beautifully. So, if there are leftovers: fear not! Put ’em in the fridge and reheat later in the week and all shall be well. Also worth noting, this is possibly veganizable if you can get smoke flavor or a bacon flavor that doesn’t have any meat in it and you substitute the turkey kielbasa with a vegan sausage of some kind AND you have a vegan solution for Worcestershire sauce. (I know that sounds impossible, but vegan cooking requires resourcefulness and persistence, and it’s often quite yummy in its own right.) You could probably also meat-it-up with a beef or pork kielbasa, if you’d rather go in the other direction. I prefer the turkey kielbasa for a number of reasons, not the least of which is the lower fat grams per serving and the greater likelihood that the flavor of the sausage will work with (rather than over top of) the other flavors. 1. Coat the inside of a 4-5qt crock pot with non-stick cooking spray. 2. Chop the bacon into 1/2-inch pieces and add to the crock pot. 3. Cut the kielbasa into 1/4-inch coins and add to the crock pot. Stir to combine. 4. Add the beans to the crock pot. Stir to combine. 5. In a bowl, stir together the remaining ingredients. Then add them to the crock pot and stir to combine. 6. Cover and cook on LOW for 8-10hrs (or easily up to 12hrs) or on HIGH for 4-6hrs.